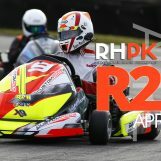 The 2017 Class Selection, after the third round every season the RHPK team put their heads together and ensure all of our teams are in the correct classes. I know there are a number of teams frantically awaiting the news to see who they will be racing with in the later part of the year. Well, what can I say? It’s been a very time-consuming task so much so that I’ve actually changed my methodology to ensure I’ve covered all bases. For the last few years, we take 20-30 random lap times from the race across all stints to build up an average for each team. If we feel like a team is dominating Clubman (Based on pace more so than results) we will look into promoting. This year is slightly different. Four out of four rounds have been sold out, meaning that 36 karts are on the track. The average on 20-30 laps was giving us a different story to what was happening in the race, given the traffic and battles throughout. 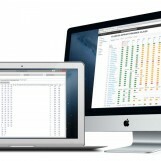 I then discarded all of the work I had completed with a view of averaging the whole race, after cleaning up the data. For each team, their times are downloaded and cleaned up, by cleaning up – removing all pit stops and excursions across the track and into the tyres (HRS Racing!) I then average the times then are placed all together and sorted. The highly anticipated season opener, with many brand new teams to RHPK. Looking at the average times (Don’t forget these are not race results) the split looks perfect. 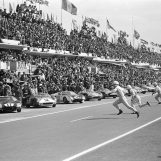 March Racing on top, closely followed by JND Racing and Amigos 2. It goes to show you how close the racing is given that just under 300 laps are averaged here with a 36 kart grid! We are always going to get some cross over into Super and this is apparent here – Newcomers March Racing just matching Lambo here. 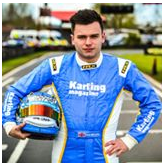 Whilst the gap to Burton Power Racing is 2 tenths – this is not alarming considering its the first race of the season. 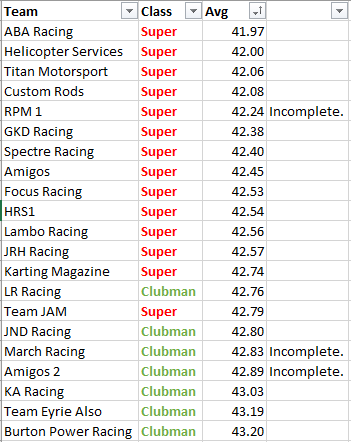 The supers that finished below Clubman this round all had issues, Spectre Racing, Amigos, HRS and Geforce Racing. R ound 2 played host to another sell out round, this time teams had a measure of each other which made for some very close racing. 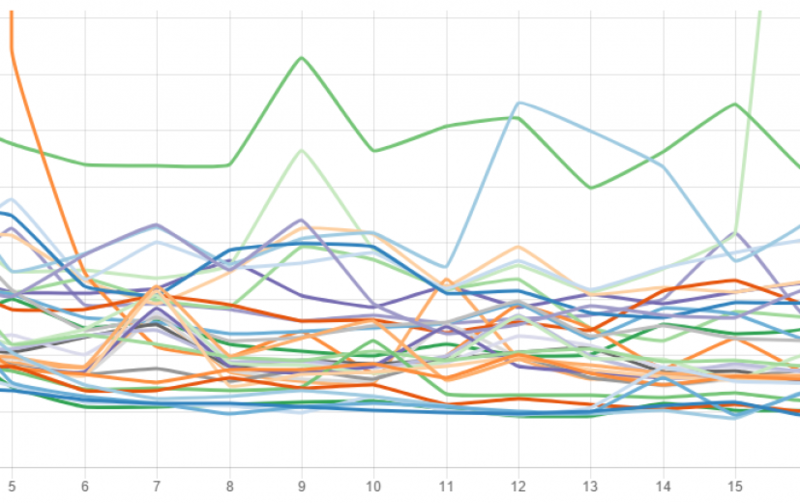 This month we see LR Racing (Brand new team) with the fastest average. JND Racing not far behind and March racing right behind, less than 0.03 to March – again, over 300 laps! Amigos 2 showing some strong pace. Note, all of the incomplete entries are based on fewer laps than the 300 – meaning that had technical issues, this can skew the results but this is all we have. Team JAM had a big off at the start of the race taking some pace out of their kart. Spectre Racing had a stand-in driver for this round who joined Derek, Stuart Allan was not driving this round. 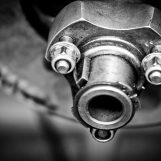 Team Karting Magazine had issues with their bearing carrier – next round they are on a 7Kart with RPM engines. Lambo was nursing a loose kingpin throughout their race which caused them to lose pace throughout the last half of the race. We had a monumental race at the top of Clubman for the first hour of the race. Once of the closest races we’ve seen this year. The first two rounds are pretty much what we are looking for, a balanced Super/Clubman grid – times close together. Round three race wise saw one of the closest races in Clubman, a real battle for SJ, KA, Polish and JND. We also saw a pace increase for JND and March. If you look at results alone you can see a clear lead from JND Racing, but it’s not from dominating the race – at this stage, it’s from very good preparation, good driving and the misfortune of a couple of teams around them – it’s what endurance is all about. If you look at pace, you can see a number of teams around the top three/four, and if you promoted them again you would have that top three/top four just different times. 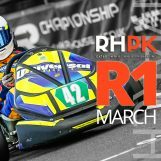 We’ve had so many new teams form this year which is truly fantastic for the series and pro-karting in general. The passion these teams bring to our series is what RHPK is all about. After a lot of data, time, effort and consideration the decision is to not to move anyone up to Super. Instead, three teams will be promoted at the end of this year. 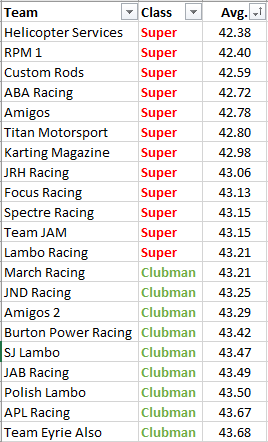 Rounds 1 & 2, three teams very close on pace, Super > Clubman split. 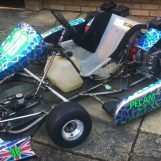 JND, March Racing, Polish Lambo & SJ Lambo all in their first year of Owner Driver Prokarting. 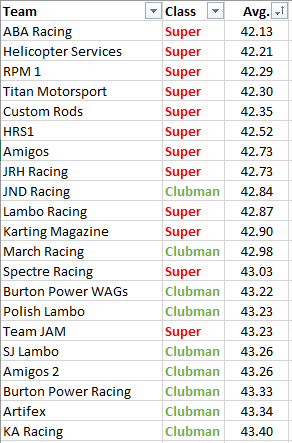 Just one standout round for JND, R3 on pace compared with other Clubman teams. At least three teams to go up for 2018. ‘I think keeping the classes as they are is certainly the right decision for the remainder of the 2017 season. At round three the Clubman class put on a fascinating race with JND Racing, SJ Lambo, Polish Lambo and KA Racing all battling. They were joined by others too and it was only mechanical problems that stopped it going all the way to the flag. JND would even admit themselves they were lucky to have it so easy but I think throughout the season we are going to see a few different winners and podium finishers in the class.